Christine E. Blum was born in Shaker Heights, Ohio. At the age of seven, her parents moved to Europe and luckily took her with them. Christine grew up in Paris, Brussels, and finally London, and along the way developed her unique brand of humor. 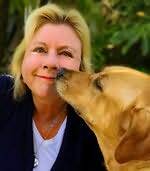 She lives in Southern California where she’s allowed to share a house and pool with her famous yellow Lab, Bardot, who just happens to be able to dive 10’ underwater, has appeared on Animal Planet, and was featured in the New York Times bestseller, Underwater Dogs. When not signing paw-tographs, she can be found lounging by the pool and solving murders.